Big changes are (presumably) coming for Kamala Khan: She's moving on to a new title and a new creative team very soon. Ms. Marvel #37 provides one more glimpse of the crazy Jersey City status quo we've come to love so much. It's a one-shot adventure that starts and finishes with Kamala Phuppo on babysitting duty for her nephew Malik. 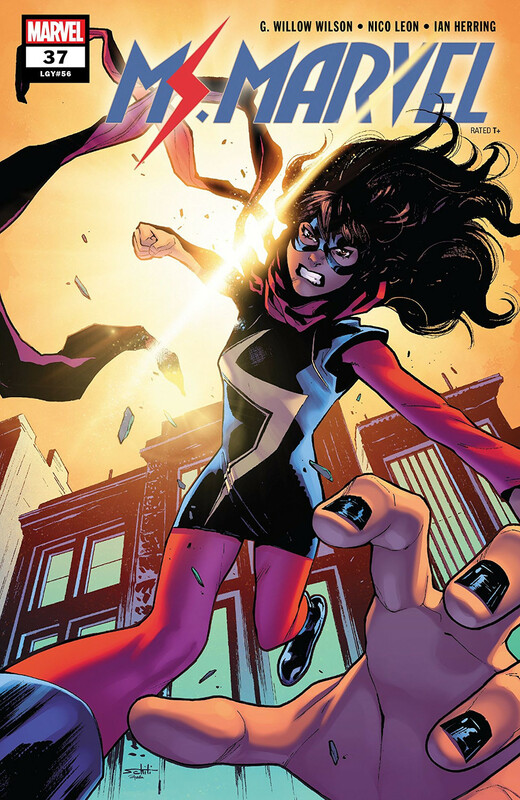 In between, of course, there's a ridiculous disaster for Ms. Marvel to dive into fixing. But this issue is really more about the supporting cast than the protagonist; it's telling (and not entirely good) that Kamala's big day-saving moment gets pushed off-page. Instead of Big M front and center, this comic gives us more of Sheikh Abdullah, Zoe's ancient veteran buddy Harold, and "he is also one of Kamala's close friends, we swear" guy Naftali. The art does a good job carrying us across a Jersey City thrown yet again into crisis mode, and there are some of the title's usual outstanding background gags. Of course somebody starts selling $50 "survival packs" a page after the ruckus kicks off. But I get the unmistakable feeling that those sight gags are included out of a sense of obligation this time around. While the visuals do a fine job of moving the story along, detail seems to be lacking at multiple points. Which is not to say that the art falls as far as unsatisfying anywhere in this issue. The colour work is, as always, a formidable bulwark to the lines, and panels that might otherwise look sparse are enriched by colours with lots of meaty texture to them. Kamala deploys a little bit of narration to establish a solid theme for the issue. It's a simple one - about the persistence of ordinary human life - and it works well to tie everything together. It's hardly revolutionary, though, for either us readers or Kamala. Ms. Marvel #37 tells a heartwarming story that concentrates on the most potentially-overlook-able members of Kamala's supporting cast. This is more of a Jersey City curtain call than a story with its own narrative momentum. That renders it somewhat inconsequential, though it is certainly still enjoyable. It's a nice bit of dessert for those of us who love this title's take on JC, and it presumably clears the decks for a more Kamala-centric finale in the next issue. I'm not gonna spoil the final panel but man I did some no-fooling Liz Lemon eyeball-rolling.